This delicious Low-Carb Breakfast Casserole with Asparagus, Mushrooms, and Goat Cheese would be perfect for a weekend brunch or breakfast for guests, and this tasty meatless breakfast is also Keto, low-glycemic, gluten-free and South Beach Diet friendly. Use the Diet-Type Index to find more recipes like this one. with Asparagus, Mushrooms, and Goat Cheese! Today begins a big food week for a lot of people, with Mexican food on the menu in a couple of days and then Mother’s Day food coming right after that. And in my family my niece Kristen’s adorable baby Wyatt is getting christened today, so there’s another occasion to celebrate with food. Of course I think all my many great-nieces and great-nephews are the cutest kids in the world, but can I just say that Wyatt has absolutely the longest and thickest hair I’ve ever seen on a newborn, which makes him extra cute. 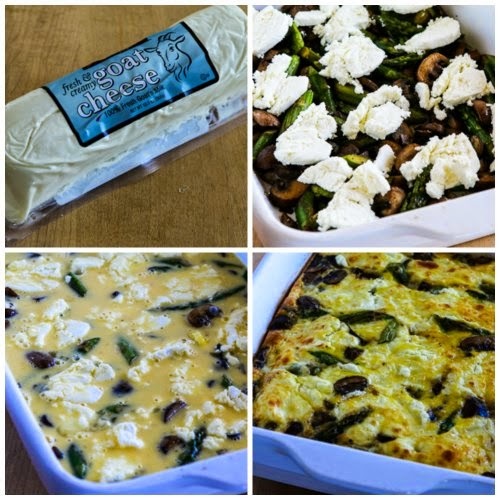 A few years ago I shared 20 Favorite Healthy Recipes for Mother’s Day Brunch, but this Low-Carb Breakfast Casserole with Asparagus, Mushrooms, and Goat Cheese is another brunch idea that I think would be perfect for Mother’s Day, or any time you have guests and want to make a breakfast that’s a little bit special. But what if your mom doesn’t like goat cheese? I don’t ever remember my own mother eating it, although the generous amount of asparagus in this recipe would have made her smile. For sure the soft goat cheese I’m using here isn’t everyone’s cup of tea, and if you think some of your guests might not have gained an appreciation for it, I’d use Feta cheese or even grated Mozzarella to make this. Wash mushrooms and cut into thick slices; then saute in a small amount of olive oil in a non-stick pan. (I used my new favorite Green Pan for this.) When mushrooms have released all their liquid and slightly browned, put them in the bottom of the casserole dish. Add a little more oil (but don’t wipe out pan) and saute the asparagus 3-4 minutes, or until it’s barely starting to get cooked and has turned bright green. Put the asparagus in the casserole dish, season with Spike Seasoning and black pepper, then gently stir to combine the vegetables. I love the melted goat cheese in this Breakfast Casserole with Asparagus, Mushrooms, and Goat Cheese! Are you a goat cheese fan like I am? This delicious Low-Carb Breakfast Casserole with Asparagus, Mushrooms, and Goat Cheese would be perfect for a weekend brunch. Preheat oven to 375 F/190C. Spray a glass or crockery casserole dish with non-stick spray or mist with olive oil. 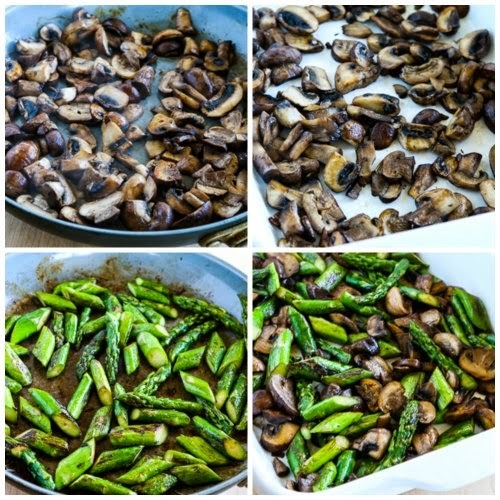 Wash asparagus and mushrooms and spin dry or dry with paper towels. Cut mushrooms in half lengthwise, then turn and cut into half slices. Put mushrooms into the casserole dish. While the mushrooms cook, trim off woody asparagus ends, then cut into pieces about 1-2 inches long. Add a little more oil to the pan (but don’t wipe out the mushroom residue) and saute the asparagus 3-4 minutes, until it is barely starting to turn bright green. Add asparagus to casserole dish and gently stir to combine with the mushrooms. Season vegetables with Spike Seasoning and fresh-ground black pepper. Remove goat cheese from refrigerator and slice into thin slices. Layer slices of cheese on top of asparagus and mushrooms. Break eggs into mixing bowl, add milk, half and half, or cream (if using), and beat eggs until whites and yolks are well combined; then pour the eggs over the asparagus, mushrooms, and cheese. Bake about 45-55 minutes, until eggs are well set, cheese is melted, and casserole is starting to brown a little on the top. Serve hot, topped with sour cream if desired. This can be refrigerated and re-heated in the microwave. 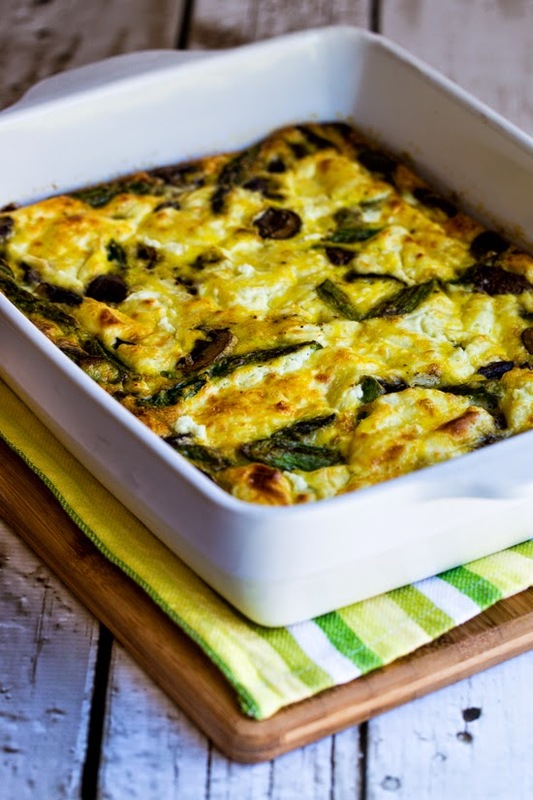 This Breakfast Casserole with Asparagus, Mushrooms, and Goat Cheese would be a good choice for any phase of the South Beach Diet or any other type of Low-Carb or Low-Glycemic eating plan. Thanks for linking to one of my egg casseroles. I love them just as much as you do! And I've also recently made one with asparagus and goat cheese, which is a favorite combination. Lydia, great minds thinking alike I guess! Just made this for mothers day brunch. I added scallions in the casserole as well as on top as a garnish. It was a BIG hit. So yummy!! Can't wait to try this recipe. I am a great fan of your site. You can freeze and thaw this, but I think it definitely affects the quality. When it's frozen, it releases liquid when it thaws. I used to freeze this type of dish, but now I'd be much more likely to just make it a few days ahead and keep in the refrigerator. If you're reheating the whole thing I'd use the oven, otherwise just microwave for 1-2 minutes. Still enjoying your site and recipes and still planning for my Feb brunch. Am curious about the freezing of this. If you freeze and thaw in fridge, how do you reheat? And does freezing change the taste? Perfect recipe for asparagus season, which is thankfully upon us. You never fail to amaze me with wonderful recipes. Love the idea of sun-dried tomatoes! Monique, I’ve talked to a lot of people who’ve switched to South Beach after doing a more low-carb approach. I think you just need to be careful about slowly adding back whole grains and other “good” carbs to your diet. I strongly recommend reading the whole South Beach Diet book (the newest one is best) and then starting on phase two. Hi, I have recently lost 50 pounds on Atkins Diet. I still have 70 more pounds to loose. I need a change. Souyh Beach diet seemed the most logical choice. Has anyone made this switch? If so. how did it work for you? Andra, hope you will really enjoy it. As you can tell, I’ve really been staying away from the computer for a few days! I do appreciate all the Christmas and New Year’s wishes from my great blogging friends and readers! Happy Holidays to you, Kalyn. Thanks for a year’s worth of good food thoughts. Your blog is one of the first I read and and a solid favorite. Here’s to a great new year. Kalyn, this a really nice recipe, I love it. Merry Christmas, Kalyn. I just might make one like this for the family. Thanks. Kalyn–This sounds delicious! And I applaud your admitting to having overcooked it. Personally, if I decide I would change a recipe when I post it–a little more of this, a little less of that–I just write the recipe as I would prepare it. Kalyn, I hope you are enjoying your down time with your family and a very happy holiday season to you! This sounds like a great altetnative to the usual breakfast casserole that incorporates sausage, and I will try it the way you suggest! You do the Christmas casserole too? I thought just my family did this! We always have it every Christmas morning without fail! Great recipe. Merry Christmas and Happy New Year Kalyn! We all are guilty of leaving a dish (or three) in the oven too long. I think your photo looks delicious despite the overcooking and I just may make it this weekend for a family crowd that will be arriving on Friday. Hope your Christmas was relaxing and wonderful Kalyn. All my best to you in 2008! This is a great one for a crowd! I am glad you are taking a break! I hope you have a wonderful holiday season! Thanks for all of your wonderful blog entries! It looks delicious (not overdone at all), Kalyn. And I’m so glad to hear that it is a forgiving recipe so that it tastes good even if you do think you’ve cooked it too long. P.S. This morning, we had an omelette made with leftover ham/peppers/onion spaghettini with toast spread with goat cheese. If we’d had mushrooms, we’d have added those too. I am a huge fan of breakfas casserole’s like this. I am so excited to try this one soon. Happy Holidays! Enjoy your break. This looks like a perfect dish to come downstairs to on Christmas morning! Too much cheese? Never! 🙂 I love goat’s cheese…mmm! Wow, looks great! I wish I’d checked here on Saturday when I was supposed to be making a breakfast casserole for a Sunday brunch at a friend’s house. I ended up punting and making stuffed mushrooms which turned out fine, but I really wanted breakfast casserole and couldn’t find a recipe that didn’t use bread as its base. Sounds heavenly for a Christmas brunch Kalyn. I’m glad that you had such a wonderful holiday filled with happiness, contentment and love. This looks so delicious! Glad you are taking a few days off to enjoy family. What a great breakfast! Happy Holidays! It looks wonderful – I’m already getting impatient for aspatagus season. Happy Holidays – relax and enjoy! Thank you for the research, time, work, and knowledge you put in each and every post of yours throughout the year. Even though I do not comment often, I enjoy visiting your blog each and every time I come around. Merry Christmas to you and your loved ones. Enjoy a well earned rest! Oh this dish is oozing with goodness. Happy holidays, Kalyn. May your days be merry and bright. What a lovely-sounding recipe! The Christmas Eve has just come to end here, and we’ve had two Christmas meals already. I think we’ll opt for a rather light breakfast tomorrow, but your recipe would be excellent during cold winter mornings! This looks great! I love the idea of a make-ahead breakfast. I never would have thought to make eggs in this way, in a casserole dish. Very nice, it’s hard to go wrong with asparagus, mushrooms and goat cheese! Happy Holidays from One Food Guy! this is perfect for xmas brunch! This one really rocks me Kalyn. I love every ingredient and it looks easy to get into the oven! I’m thinking new years! Merry Christmas to you and all you love. I would have loved to have this for breakfast!